Previous Post: It’s beginning to look a lot like Christmas… NOT! Next Post: Why I love Bliss Kiss Simply Pure™ Hydrating Nail Oil! The engagement season started a few weeks ago. One niece and two ladies from work all became engaged in a few weeks of one another. 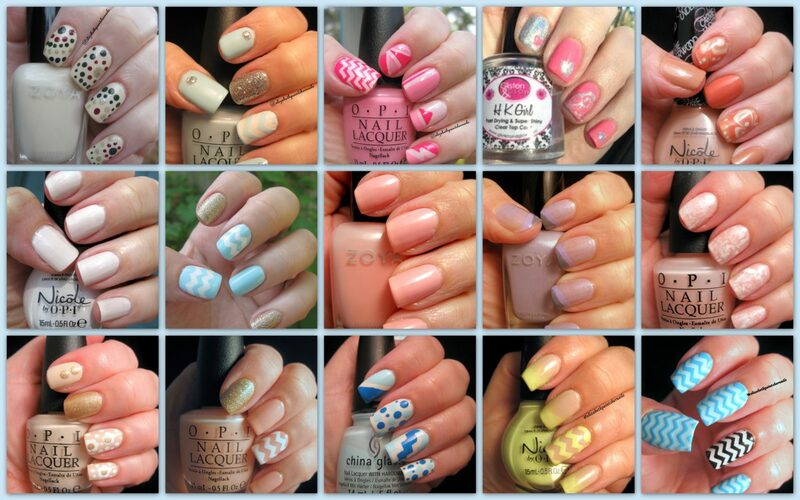 Moving on past my buckets of strangeness, and onto manicures! It took me more than a few tries (and a few stampers) to become comfortable stamping. I am still not a super stamper, but I am getting there! Here in the picture on the left, I am wearing Lucky Lacquer in Hera, stamped using Rica’s Blackout and UberChic’ Love & Marriage plate, topped with Rica’s Glossy Glam. The idea for this mani is from twi_star on Instagram! I know this is not a traditional wedding mani, but I thought it was nice, and a little more grown up. I know many people love a classic french manicure for weddings, regardless of whether you are the bride or attendant or any ole’ guest. To me, this manicure screams, BRIDE! I started with Essie’s sugar daddy. The tip and the lace was done in Rica’s Whiteout. 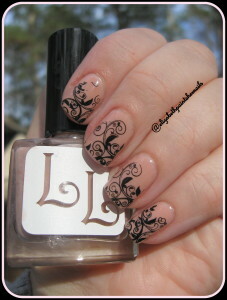 The stamp design is from UberChic stamping plate #1-3, and was topped in China Glaze Fairy Dust! My last wedding manicure for today is a little something different from me. All stamping designs are from UberChic’ Love & Marriage plate. 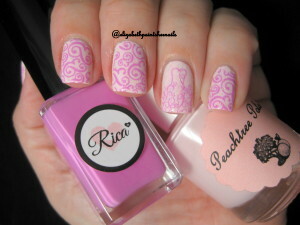 The baby pink is from Peachtree Polish called Pink Dogwood, and the stamping was done by Rica’s Pink Cloud. The manicure was topped first by China Glaze’s Fairy Dust then Rica’s Glossy Glam. What the theme of today’s manicures? Besides weddings, it is Rica Stamping Polishes are freaking awesome!! I mean crazy good! I am on my second bottles of Rica’s Whiteout and Blackout. The polish is extremely opaque and super wicked awesome good for stamping!! Go to the site and check them out – Rica ! Posted: December 15, 2015 December 16, 2015 . Bookmark the permalink.